I’m super pleased that I have three poems appearing in the spring issue (40.2) of Room Magazine, edited by Meghan Bell. “Dust,” “Love and Nintendo,” and “Creatures” explore the after-effects of sexual violence, and I so appreciate that they found a first home in such an awesome feminist magazine. There are lots of other fine writers featured in this issue, and I’m honoured to be in such good company. You can now order the June issue for Room‘s pre-sale price of $9 (25% off) until May 15. Check it out! You can also read Meghan Bell’s editor’s letter, as a way of introduction to the issue, right here. My heart is all aflutter! Tomorrow (Saturday, November 15) is Swoon Fall 2014! 7pm. Trees Coffee at 450 Granville St. Be there and BE LOVED! I’m thrilled to be hosting with Sierra Skye Gemma to bring you performances by andrea bennett, Lucas Crawford, Shannon Rayne, Andrea Routley, Ellie Sawatzky, Mallory Tater, and Janine Alyson Young! 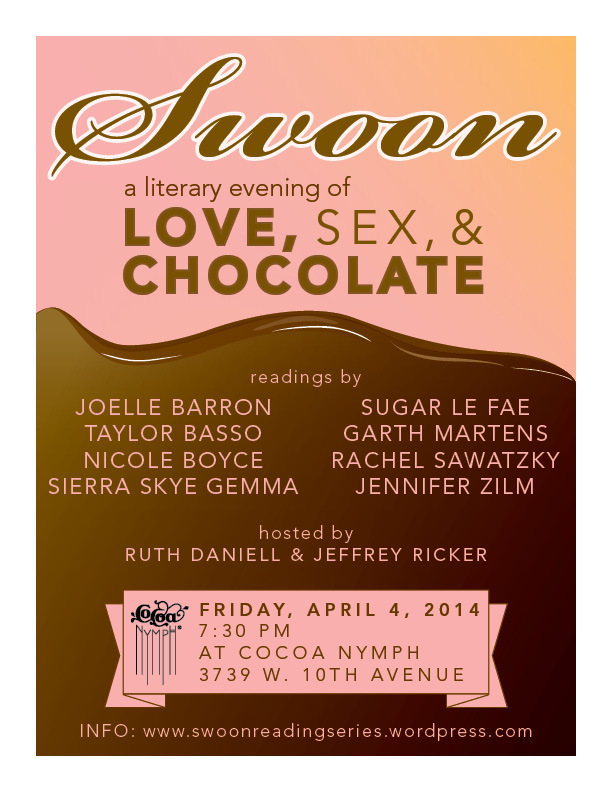 It’s going to be a wonderful evening, full of love, literature, and chocolate cheesecake. Check out the details over on the Swoon blog! Please consider RSVPing for tomorrow’s event on Facebook. I would love the chance to anticipate your lovely presence! I also encourage you to like our page on Facebook to receive our status updates and connect with other Swooners! You can also follow Swoon on Twitter at @swoonvancouver. 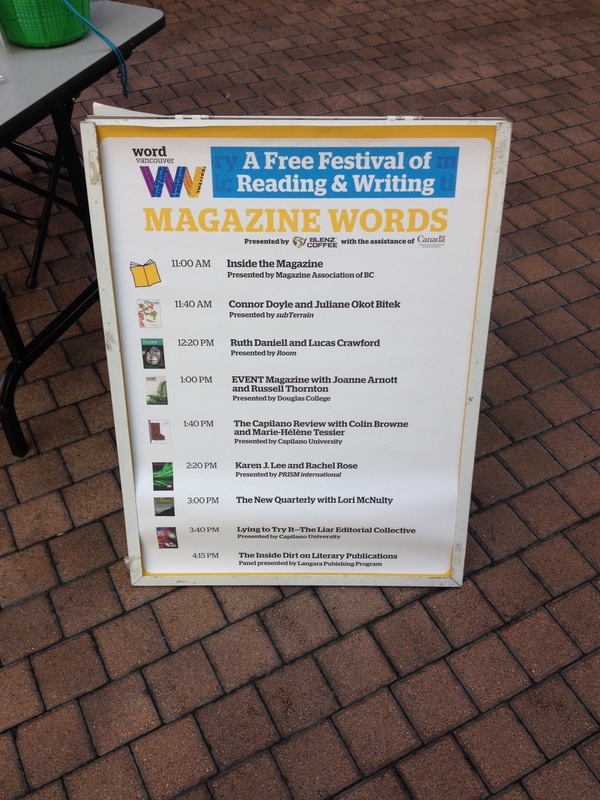 I had an amazing time at WORD Vancouver on Sunday, September 28! It would have been hard not to, though, because we couldn’t have asked for better weather. What an incredibly gorgeous, sunshiny autumn day! The first things that I did when I got there was sign-in and collect my nametag. I was excited to discover that I am a Very Important Person. After I got my nametag, I spent a happy hour catching bits and bites of other performances, and gawking at all the amazing word-loving organizations with their books and magazines proudly displayed under tents and on tables. I stopped by to visit my friends at PRISM international and got a silly picture taken. After that, it was time to meet up with the editors of Room Magazine and to get ready to share some words. 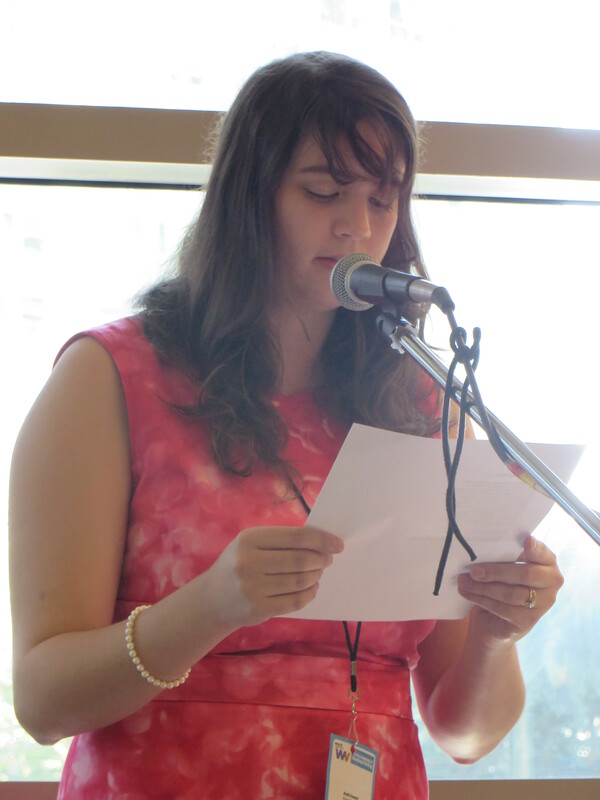 Me performing my fairy tales for Room Magazine at WORD Vancouver. Photo by James Daniell. The reading was so wonderful. Taryn Hubbard and Meghan Bell were lovely, warm-spirited hosts, and I was so pleased to meet my fellow Room contributor, Lucas Crawford, whose self-deprecating humour, and his obvious love and empathy for others, brightened the performance of his poetry. 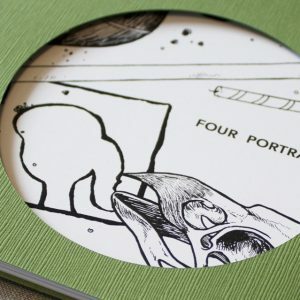 Check out “Expanding the Voice,” Room 37.2, the issue that features his work. Of course, I am still most excited about Room 37.3, “Geek Girls,” the issue I had the honour and pleasure of representing at WORD Vancouver. I performed my two fairy tale-inspired poems from “Geek Girls,” which you should hurry up and read already! Then I shared a couple of my dramatic monologues of women from fairy tales. It was a lot of fun to read most of that work to an audience for the first time. I’m so grateful to Room and WORD Vancouver for giving me the opportunity to do so! Reading one of my bonus fairy tale poems from my working manuscript. Photo by James Daniell. Just had to share this picture I snapped of the gorgeous Sunday sunshine at the Central Library . Thanks again to everyone who came out to WORD Vancouver to see me and hear my poems. It was lovely to see you! I hope October is off to a magical start for you all. It’s always so nice to see your name (spelled correctly!) on a big sandwich board. Click to see this image bigger!